Welcome to the twenty-second volume of the Vegetarian Cookbook and Vegetarian Recipes Collection!! Buy this book now at its introductory rate before we raise the price to the normal price of $9.97. Are you looking for Great Vegetarian Recipes which are delicious and easy to make, but also fit into your vegetarian diet? This recipe book contains 201 vegetarian recipes for breakfast, brunch, lunch, dinner and snack time. These are recipes to use in your slow cooker or dutch oven, recipes for vegetarian muffin tin meals and desserts, as well as some 5 ingredient or less recipes for vegetarians. I hope you enjoy and can use the Veggie Value Pack II. What Specific Type of The Best Vegetarian Recipes Will You Find In This Book? 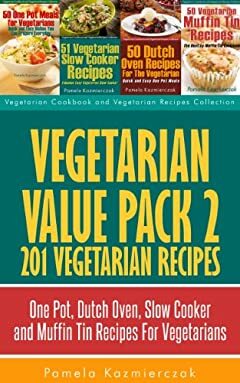 Inside Vegetarian Value Pack 2 - 201 Vegetarian Recipes â€“ One Pot, Dutch Oven, Slow Cooker and Muffin Tin Recipes For Vegetarians you will find a wide assortment of healthy recipes. Now that you know more about this book and why it is for you do not forget to scroll up the page and click on the buy button above so you can start enjoying your new 201 vegetarian recipes today!